I don't often review many cafes, or breakfasts, on the blog mainly because I don't tend to go out to eat breakfast (neither would you if you could eat Mr GF's pancakes) but I do go to plenty of cafes and definitely have my favourites. Even so a whole blog post on a chicken salad on toast or a piece of cake and a coffee is hardly riveting stuff. But sometimes there's more to a place than you'd expect. 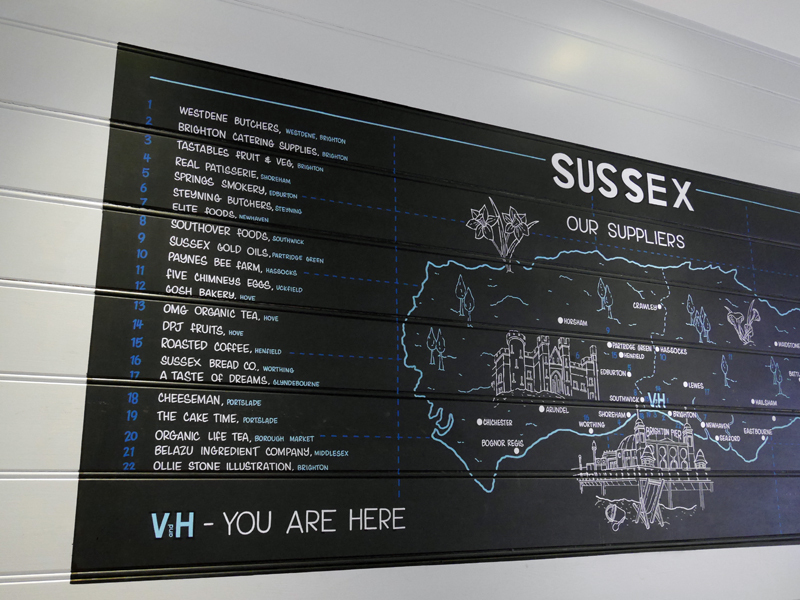 As you walk in to V and H Cafe, a painted mural lists their main suppliers. It's a celebration of Sussex produce really and why not get everything locally if you can? 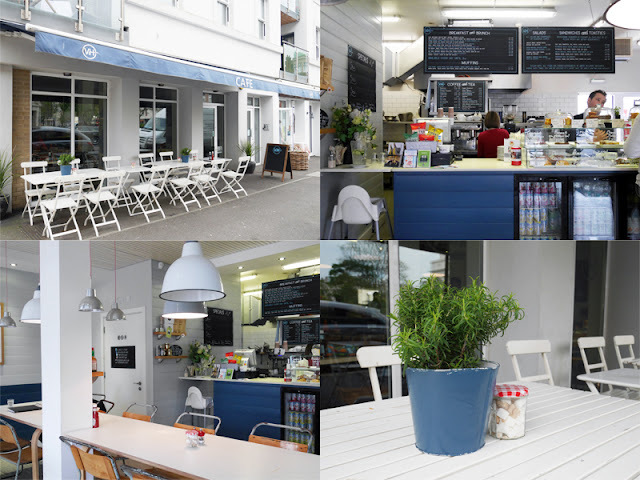 This is a real USP of this cafe. When food is as simple as breakfast, sandwiches and salads, quality of ingredient and attention to detail is what sets you apart. 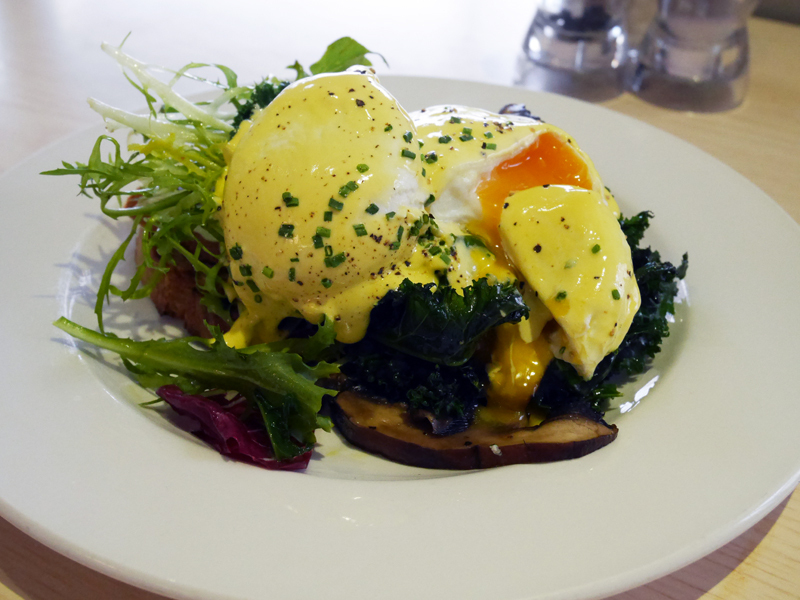 As soon as my Eggs Florentine arrived I knew that these values were strong. Two perfectly poached eggs from Five Chimneys Farm in Hadlow Down (laid on the day of delivery) sat on my favourite chewy brown bread from Real Patisserie, with lightly cooked kale, mushrooms and frisee salad. And not too much Hollandaise sauce either. A gorgeous combination, much better than the typical spinach in the dish with the more robust kale. I wolfed the lot down. My dining companion was the other man in my life, my five year old son, whose love of breakfast is making me more enthusiastic about it too. His face was a picture when his breakfast turned up, tailored from the standard menu and fit for a small prince! You see some really sad sausages in breakfast shots but this free range one from Westdene Butchers was fanastic, free from any fillers. The thickly cut rasher of bacon also came from them too. 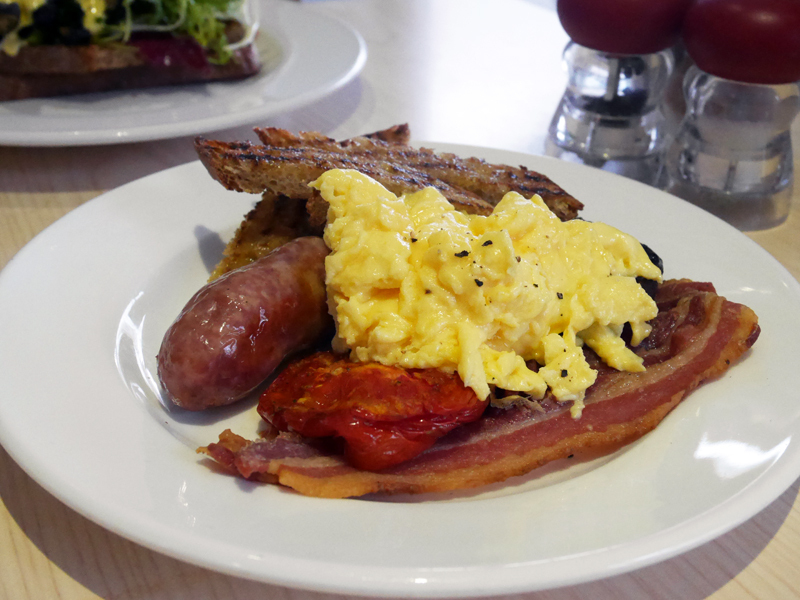 Soldiers cut from chewy brown and a generous helping of butter rich, golden scrambled eggs. A nice touch was the homemade baked beans, made from a mix of butter, kidney and haricot given a slight kick of heat from chilli. So much nicer than tinned. A lot of the menu can be adapted like this, the possibilities are endless but unlike some cafes who refuse to deviate from the menu, they are quite happy for you to customise - a particular bonus for those dining with little ones. 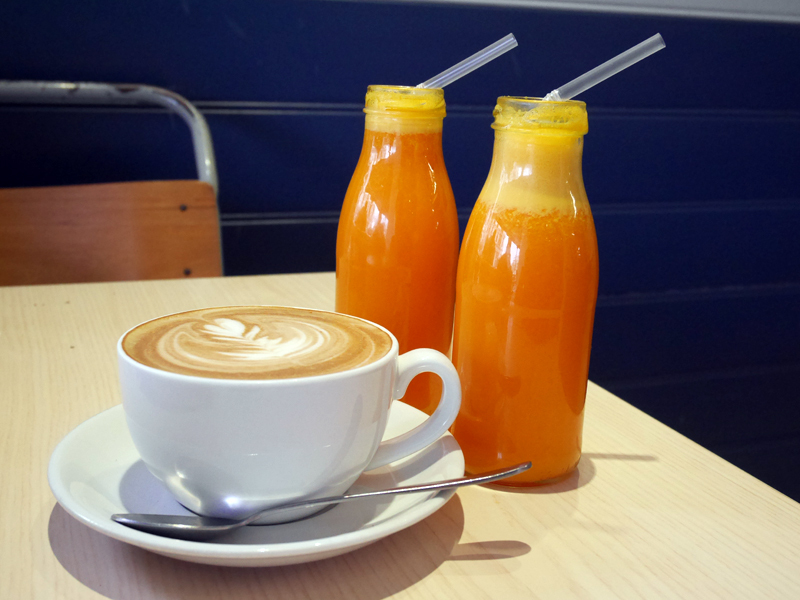 Coffee was great from Roasted in Henfield, as was the freshly squeezed juice made even more invigorating with ginger and turmeric. We took some cakes home, made by Andrew Mikolajczyk from The Cake Time (previously head baker of Flourtown Bakery and cafe which was here before V and H Cafe took over). 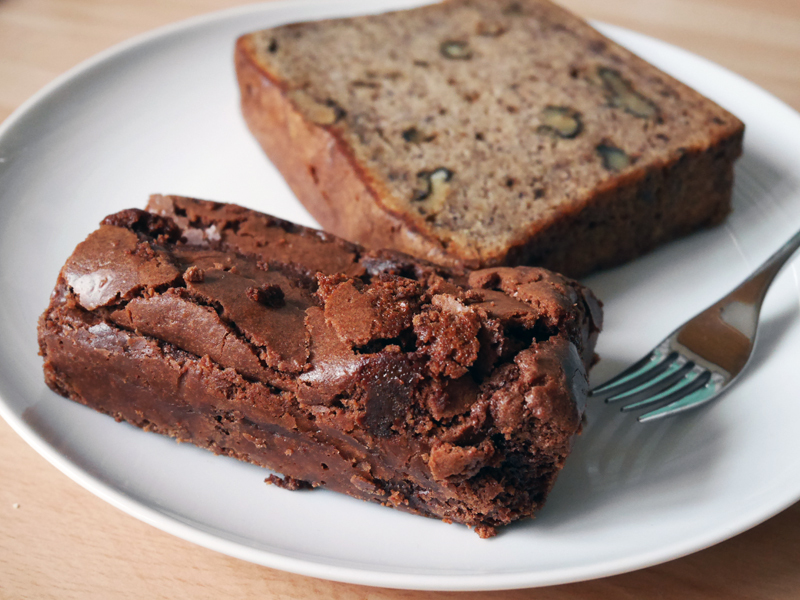 The slice of walnut and banana cake was really lovely. Traditional, honest and light, just as I like it. (I really have zero time for lurid, over the top cakes with piles of frosting and decoration.) The salted chocolate brownie though - this was the best textured brownie I've had. Not overly gooey but melting and crisp with a tinge of saltiness that makes it more grown up. I'd walk to Palmeira Square from Kemptown just for this. Service is faultless, friendly and welcoming. I noticed a table of clearly well treated regulars that small businesses like this do well to retain. I'm really glad I trekked over. This isn't my neck of the woods but if it were, I'd be in a lot, believe me. You can't fault the quality, service or attention to detail at all. I dined as a guest of V and H Cafe. Words and thoughts, as always, my own.